Denver’s neighborhoods are experiencing a major change right now with a larger than normal influx of people moving here along with long time residents experiencing a jump in their house value and deciding to renovate. As a designer, I drive in and around Denver neighborhoods almost every day and it is interesting, and occasionally startling, for me to observe neighborhoods changing on a month to month basis. I’ve never experienced change like this in a city before and it is a bit unsettling. I think that’s why a project like this one is special to me. This home is a 1920’s Craftsman Bungalow on a beautiful tree lined street in Denver’s Historic Congress Park. My clients loved the location, the street and the home, but needed to expand its square footage to be more in tune with a 21st century lifestyle. They did what many people do in this situation and raised the roof yet they did it in such a stylish and thoughtful way that respects the original Craftsman Bungalow and respects the neighborhood that I always leave their home thoroughly in love with its charm. Here are some of the renovated and brand new bathrooms in the home – I can’t wait to share the rest of the home with you once we’ve finished with the final touches! 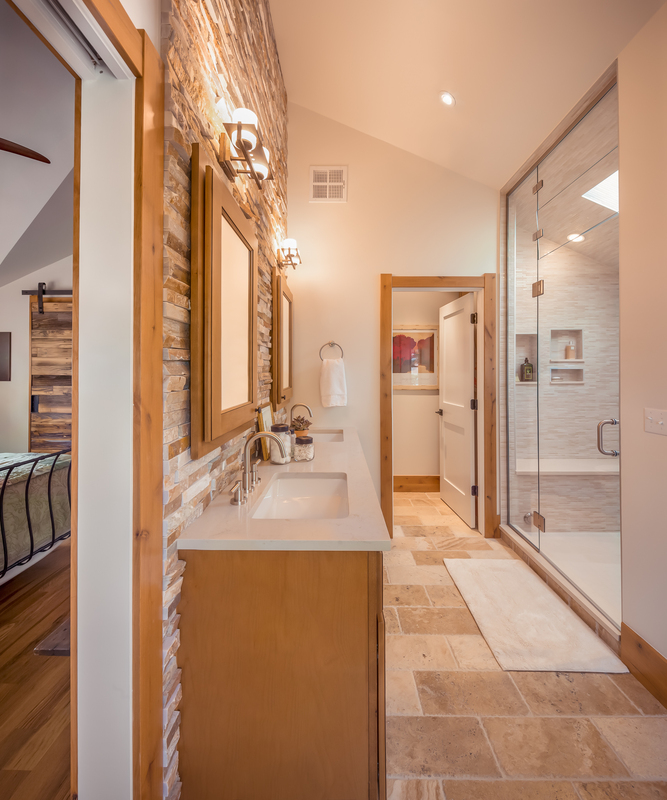 The Master Bathroom: you can see a little bit of the master bedroom on the left and an awesome barn door that the contractor made from an old fence in the yard. The flooring in the bathroom is honed travertine. 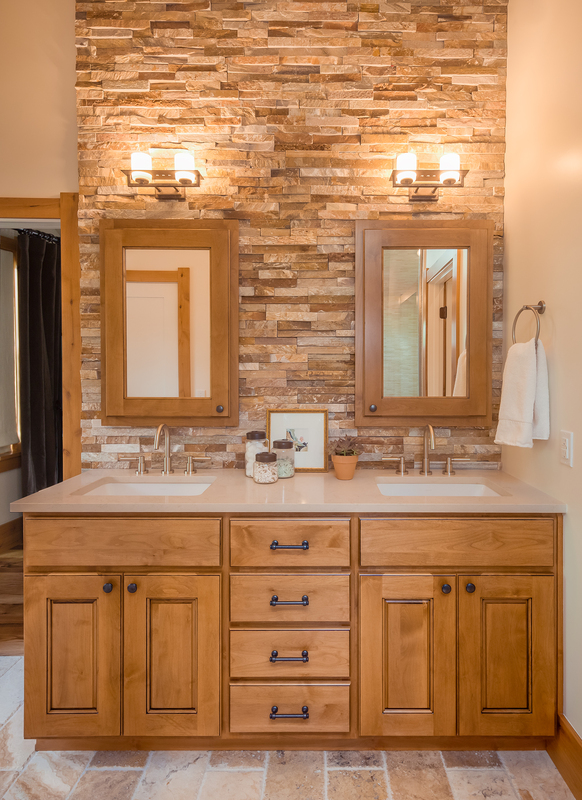 Here’s a great view of the rock wall with custom, inset medicine cabinets and a custom vanity in alder to match the knotty alder trim in the home. Note the trim around the door was kept Craftsman style to match the original trim in the home. I love that this little family home has retained it’s original bungalow charm and has expanded just enough to hold its 21st century family in style. 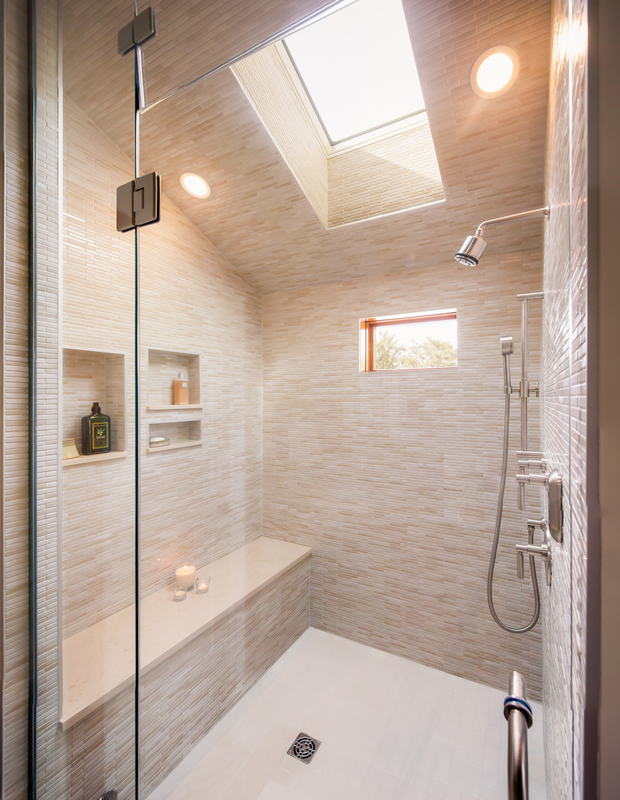 In the walk-in steam shower is one of two skylights in the new upper level. The other skylight is right over the stairs – right where you need it to make your way down. 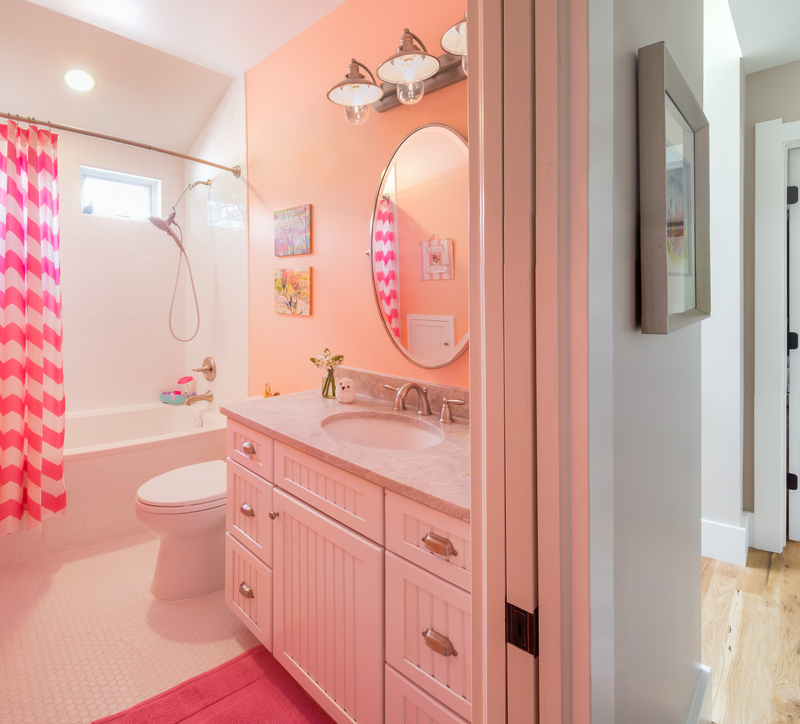 The daughter’s bathroom: bright, clean and spunky! White hexagonal floor tile and white subway tile in the shower keep the look bright. The client and I found the gorgeous granite remnant in a local stone yard and had it made to fit the pre-made vanity. 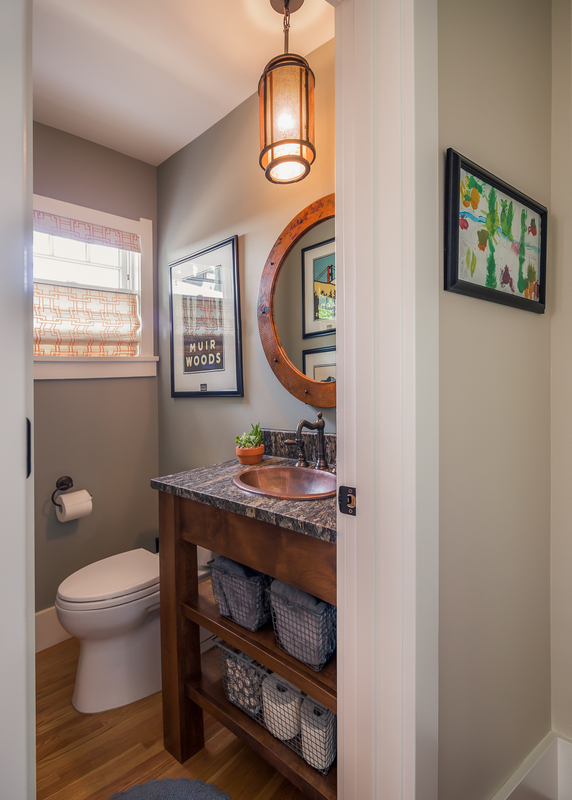 This main level powder room is part of the original home. We had the vanity custom made and used leathered granite on the top with a copper sink, copper mirror and copper details on the light fixture. Artwork by the client’s daughter graces the hall outside. I think this home is a good lesson in loving where you live. Most of the time, it’s a very good thing to live in a house for a while before you renovate. You learn a lot about a home by living in it: where the sunlight falls, what your street is like, what your neighbors are like, which tree has the best shade and what part of the home you feel most comfortable in and where you feel most uncomfortable. It’s really hard to get those things from a few walk-throughs and, while some of them don’t sound design related at all, they are. Try letting your house tell you what it wants to be when it grows up. You might be surprised at the good ideas that come from it! Love the renovations! Some great idea and beautiful design! Thanks Lori! This was a fun project to work on!